In 1857 extensions were built each side of the Chancel, and in 1864, the Western end was extended, and an outer N Aisle was added. 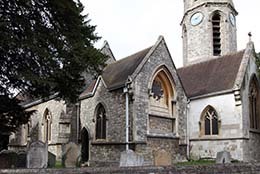 The church had been connected with St George's Chapel at Windsor Castle since 1350. They were all made by O'Connor, as were another 6 in the church. Another 8 were made by Lavers & Barraud. The new church had inspired local people to fill the windows with glass in memory of members of their families. Datchet church therefore has a splendid collection of stained glass from the 1860s, whose style in rich colours is now more appreciated than it was through much of the 20th century. We show 19 windows.